Today we are guiding you through the controls and interface so you get more easily into the game. A commander can only be good if he knows his tools well. Hold shift for adding waypoints to your troops, each command will be saved and fulfilled one after another. Direct control is one of the most powerful features the game offers you, directly control each single unit you have and fight the battle yourself, as a soldier, tank crew or gun commander! You are able to control every single soldier by your own via the "direct control" feature. 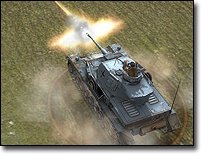 This feature allows you to participate in the combat and aim for specific targets. To do so just select your wished unit and press the required button. You can either move your soldier or drive any vehicles you wish. The camera won't follow your movements, in order to allow you to concentrate on your aiming! By clicking on the right mouse button you can switch to your secondary weapon, also the same button for switching back. 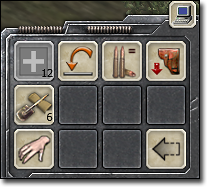 For simple reloading your rifle or changing your tanks ammo, just press the "0" key. Squad selection can be disabled and enabled in Men of War, squads will automatically share ammunition and other important stuff. You can either play with fix squads or with autocreating squads. If you want to select your squad, you can press the squad icon on your left side of the screen, or simple hold your left mouse button and drop a box over your squad. If you want to select a single soldier just simple left click on it. Double click will auto assign a new squad leader. For alternative (classic) selection, check the options. Your soldiers will auto follow your assigned squad commander. The game will auto assign squads, you can either dismiss a squad on the right panel or just hold the shift button + left mouse button to create a new squad. 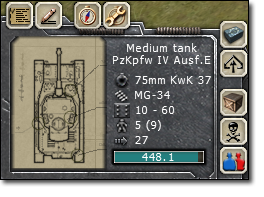 Excellent way to assign soldiers to a tank! You can go to the options and turn the game into standard RTS selection without fixed squads. Additional short keys that are helpful for you. Objectives - displays you the objectives of a mission or gamemode. Message history - displays the messages given during a campaign game or multiplayer session. Minimap - toggle on/off the minimap. Map setup - displays the minimap options. Inventory - Opens the inventory of a selected unit. Direct control mode - toggle on/off the direct control mode. Highlight objects - highlights all objects in red that can be picked up on the map. Highlight corpses - highlights corpses that can be searched through. 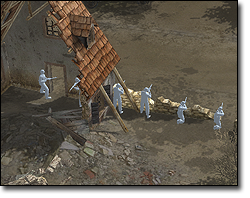 Highlight silhouettes - highlights friendly and enemy units behind obstacles. The middle control button is fully customizable, every button can be drag and dropped via your right mouse button. To remove a button just drag it out of the interface. If you want to have a button from your right panel, just drag it over into the center panel wherever you wish it! The upper row of the buttons, are click through buttons, they switch by clicking on it. The game won't display buttons which are not available for your selected unit. The second row of buttons are subfolders, which can be identified by the small arrow on the buttons corner. 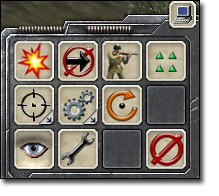 The first one of the second row displays all attack buttons, the second all engineering your unit can do. The next two buttons are action buttons, turn around and leave vehicle. The third row is an action button row as well. Action buttons - All action buttons can be drag an dropped with the right mouse button into your center panel. You can user define the center panel however you wish, just drag and drop your wished buttons into it. Game options - Opens the game options. 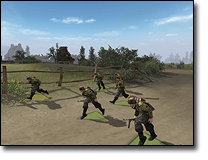 Men of War has a very detailed physics system that offers you an unlimited amount of tactics to defeat your enemy. The game has several help functions that make it easier for you to understand the game. Since the game also calculates the impact angle of the projectile, make sure you are always aiming at high angles and avoid flat angles to have the best chances to succeed. Furthermore the game calculates structural losses of an armour plate if it is hit multiple times. 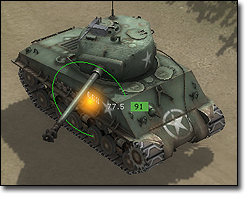 So don't stand into enemy fire for too long or your tank may break down even by an enemy tank which was too weak to destroy yours with the first shot. 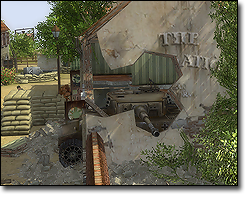 The structural damage is indicated by textures on your or the enemies tank and the damage messages appearing. 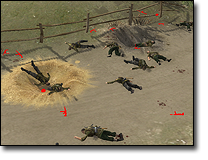 In open field tanks are an easy target for at-guns, so always hide them and never leave them standing around without infantry. In cities you have a bad overview and infantry can come and hide everywhere, make sure your tank is covered into all directions and you only show it when it's necessary. 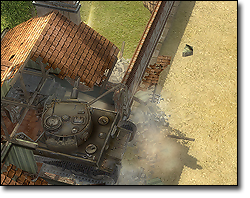 In addition your tanks are much more vulnerable in cities because of the short fighting distances, the first shot is mostly a kill so make sure you find good cover, hide and let the enemy approach. But cover is not only important for your armoured troops it's also the key to success for your infantry. 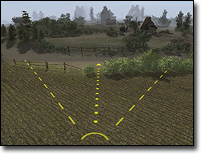 The game will show you the possible positions and covers your soldiers will take, when sending them to a new location. Those positions are indicated by white silhouettes on the target area. 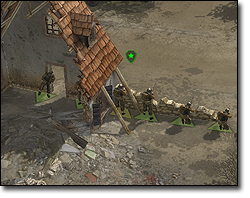 Make good use of this feature, because it will show you in advance how effective the cover will be and how your soldiers will be placed before you even send them. Cover is of high importance to achieve tactical advantages. Suppressive fire will button the enemy and they hardly will shoot back or have any chance to retreat without high casualties. Use this to flank the enemy and to attack them from uncovered angles. Now you are able to place your grenade between their legs.